Dave Volkman was in Germany for a wedding about five years ago when he stumbled upon a possible new crop to try back home in Warren County. Volkman had grown produce for several years at his small 12-acre Maineville farm, but he was looking for something that would be a better fit; produce had a small profit margin in light of the amount of work that went into growing it. While in Germany, he found himself driving through large fields full of green plants growing up trellises. 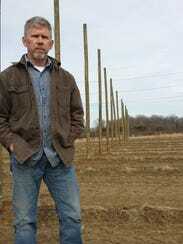 “It kind of clicked for me that might be it,” Volkman said of the hops fields. It’s an unfamiliar sight in Ohio but quite normal in Germany, where nearly 43,000 acres are dedicated to growing hops — a green flower with a bitter, tangy taste used in brewing beer. Germany grew 41 percent of the world’s nearly 116 million pounds of hops last year, while the United States, primarily in Washington, grew 34 percent. Volkman was among the first Ohio growers to hop on the new crop as the state’s interest in craft brewing picked up. 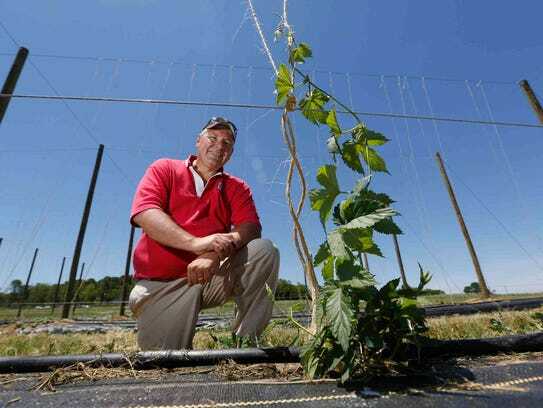 He planted his first Ohio Valley Hops crop in 2011 and connected with Ohio State University Extension horticulturalist Brad Bergefurd, who had secured grant funding to explore how to successfully grow hops in Ohio. Ohio had given up on hops a century ago after crops were wiped out by disease and pests. Bergefurd and his colleagues have been growing and experimenting with varying techniques at hop patches in Pike and Wayne counties. “It’s cheaper for us to make mistakes than for the farmers,” he said. And they’re making headway. Last year, Ohio finally had enough hops production to report to the department of agriculture, and a guild was established to oversee the industry — two major milestones, in Bergefurd’s estimation. “We’re making a lot of headway quick,” he said. Bergefurd’s goal at OSU South Centers in Piketon is to identify specialty crops for farmers and landowners looking to diversify with small but high-value crops. The plan with hops is to capture the local market and keep more of the money associated with the growing microbrewery industry in Ohio. An estimated $10 million leaves the state each year to fulfill microbrewery demand for hops. And it’s a demand that’s still growing. The five-year growth of Ohio beer manufacturer permits issued was 118 percent at the end of 2014. As of Jan. 27, the Ohio Division of Liquor Control already had issued 130 beer manufacturing permits, one more than in 2014. All but three were for craft breweries that produce less than 31 million gallons of beer a year. And at least some of those manufacturers would love to use Ohio-grown hops. “Ohio’s craft brewers have a high level of interest in receiving high quality, consistently available and of significant quantity hops. If all of that can be attained within our own state, so much the better,” said Mary MacDonald, executive director of the Ohio Craft Brewers Association. The majority of American hops are grown in three states — Oregon, Idaho and Washington, according to Hops Growers of America’s 2014 statistical report. Although the United States trails behind only Germany in hop production, American brewers still imported about 9.4 million pounds of hops in 2013 and 2014, a 29 percent increase from five years ago. Ohio hops growers are on their way to meeting demand. Last year was the first time since Prohibition the state reported hops production: 100 acres planted and 30 acres harvested. In February, Bergefurd said, about 500 people attended the second Hops Growers Conference in Wooster. “There’s a lot of interest there, especially with the downturn (of prices) in the grain industry,” Bergefurd said. Specialty crops such as hops also can be attractive to younger generations, potentially luring children back to work the family farm, he said. While yields per acre vary, Hop Growers of America reported the average across Oregon, Idaho and Washington in 2014 was 1,868 pounds. At an average price of $3.83 per pound — nearly twice the price of a decade ago — each acre of hops can bring in more than $7,000. Growers know the key to capturing Ohio’s market lies in quality assurance and picking the right hops varieties, which led to the recently formed Ohio Hops Growers Guild. “We want an Ohio variety that’s a little different and grows well here and sets Ohio apart,” Volkman said, adding a few growers with horticulture backgrounds have begun experimenting. Volkman, who is one of the guild’s directors, said the organization is working on a common definition of quality that meets Ohio brewer needs. Aside from being a stamp of approval and reassurance for hops buyers, the guild also is a resource for growers to learn, buy items for less in bulk and lobby on their behalf when necessary. Another key ingredient to capturing the Ohio brewery market is hops processing, preferably pelletized, MacDonald said. While she said many Ohio brewers have used fresh hops for seasonal brews, most use pellets because, in addition to a longer shelf life, they also provide flavor consistency. Although pelletized hops are in highest demand, Bergefurd and Volkman expect interest in fresh hops to grow this year after breweries had a successful run with the wet or green brews they made with fresh hops last year. Breweries usually make only a few barrels of a wet brew. “It’s a newer craft brew that they couldn’t make four or five years ago,” Bergefurd said, noting the recipe requires the hops to be brewed within 24 hours of being picked. If Ohio hops growers want to reach the home-brewing market — those brewing for personal use instead of profit — they’ll need to be able to offer their hops at a cheaper rate. Aaron Darnell, co-owner of The Hops Shack in Bucyrus, has been approached by a few Ohio growers, but the price was outside the range he knows his customers will pay. So far, he’s not had customers seeking Ohio-grown hops, but he is interested in selling them if the price is right. Getting that price right for that market likely will require Ohio growers to get beyond being fledgling startups to become mature operators who are seeing returns on their investments. “They’re rather expensive to get started, but once you have the infrastructure in place, (the hops plants) last 10, 15, 20 years,” Volkman said. Hops plants grow upward of 18 feet, so a trellis system will need to be at least that tall and consist of a grid of poles, cables and a drip irrigation system. Although the price can fluctuate depending on someone’s secondhand supply scrounging prowess, Volkman said a 1-acre system, including rhizomes, costs between $8,000 and $10,000. The plants typically take three years to mature, and it takes two or three years of growing at full speed for that initial investment to be paid off, Volkman said. But after that, upkeep costs are minimal. Of course, that all depends on how big the operation will be. At first, people were just “dipping their toes in,” Volkman said, but now they’ve been growing a few years, some also are growing their investments. Five have invested in a mobile hops harvester — a 2015 Bine 3060 Harvester is listed online for $13,500 — and four have invested in a hops pelletizer, which costs about $15,000. And that’s a good arrangement for Volkman and others looking for a side crop. As craft brewing began to grow in Ohio, a new permit was created for breweries that produce less than 31 million gallons a year. 2013 was the first year craft brewers could get the new A1-C permit.